3-Alfred John Richardson was born on 20 Mar 1872 in Westbury, Tasmania, died on 10 Apr 1937 in Chudleigh, Tasmania at age 65, and was buried in Apr 1937 in General Cemetery, Deloraine, Tasmania. Alfred married Louisa Charlotte Thomas Morse, daughter of George Morse and Louisa Amelia Thomas, on 19 May 1897 in Calstock (home of Charles Morse), Deloraine, Tasmania. Louisa was born on 27 Mar 1874 in Deloraine, Tasmania and died on 7 Jul 1948 in Chudleigh, Tasmania at age 74. Alfred was the first child of Isaac Simeon Richardson and Mary Ann Walker and was born at Paddy's Scrub, on 20th March, 1872. Very little is known of his boyhood days. He married Louisa Charlotte Thomas Morse at Calstock, Deloraine on 19th Mar, 1897 by the Baptist minister, Reverend S. Archer Harris. On the 9th September, 1902 he purchased 236 acres of land originally granted to Thomas Ritchie and William Henty of Chudleigh in 1850. This was part of the Mayfield property. The part bought by Alfred was originally known as Stafford Bills Paddock but was later named Glenwood. He paid £1,830 for it. They lived at Skipper's Cottage at Chudleigh while the four front rooms of the house were being built. The first building built on the property was the chaff-house. The farm was mainly natural bush bounded by the Lobster Creek. It had to be cleared by horses and bullocks with the use of stump pullers. By 1910 much of the farm was cleared and sown to grass. The house, stable, barn, grainery, chaff-house and cart shed had been built. By this time their family had arrived — Harold Isaac George, 12th June, 1898; Leila Effie May, 5th July, 1901;Ella Louisa Mary, 15th February, 1905; Arnold Alfred Charles, 18th May, 1909; Ethel Amelia Ellen, 26th November, 1911 and Raymond Vernon Ira, 1st December, 1913. The children all attended the State School at Chudleigh but were all expected to work hard on the farm tending the horses and cattle, producing poultry and eggs and making butter. As the boys grew older they continued clearing the property, erecting fences and planting crops of oats, peas and turnips. 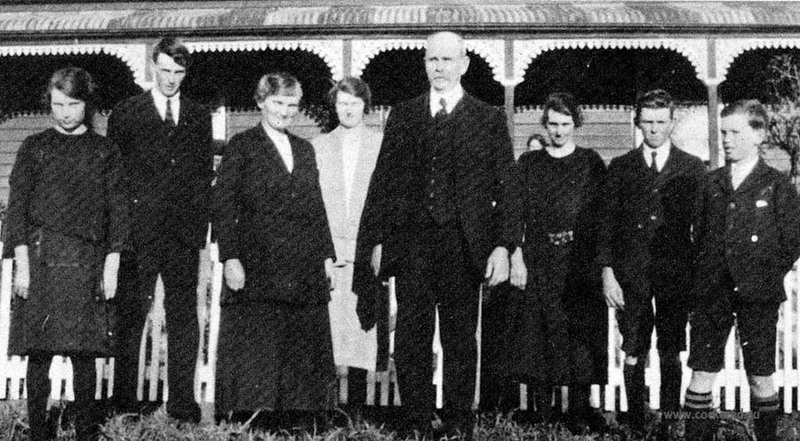 In the mid 1920's, Alfred and his sons built up a stud of Australian Illawarra Shorthorn cattle and exhibited them at most of the agricultural shows. In 1933 and 1934 they had the grand champion bull and heifer at both the Launceston and Devonport shows. They also had a pure bred Lincoln Stud but they were not exhibited. Alf was prominent in the Methodist Church being a local preacher, and also in the Chudleigh Show Society. In later years he became badly afflicted with rheumatism and eventually became bed-ridden. During this time he wanted to see his champion A.I.S. heifer so Arnold took it into his bedroom, followed closely behind by Ethel with a shovel. He died at Chudleigh in April, 1937 and was buried in the Deloraine cemetery. 4-Harold Isaac George Richardson was born on 12 Jun 1898 in Deloraine, Tasmania and died on 28 Jun 1974 at age 76. Harold married Edith Olivia Maude Stone, daughter of Harold Edward Stone and Maude Mary Eliza Bott, on 25 Apr 1928 in Caveside, Tasmania. Edith was born on 29 Jun 1908 in Deloraine, Tasmania and died on 26 Oct 1985 at age 77. They had six children: Graham, Maxwell Alfred, Connie Edith, Allan George, Enid Dorothy and Wayne Leigh. 5-Graham Richardson was born on 3 Feb 1930 and died on 1 Mar 1988 at age 58. Graham married Dulcie Stephenson. Dulcie was born on 22 Nov 1937. They had five children: Linda Louise, Lesley Anne, Rosemary Jan, Mark and Andrew. 6-Linda Louise Richardson was born on 5 Apr 1959. 6-Lesley Anne Richardson was born on 27 Apr 1960. Lesley married Raymond How. Raymond was born on 15 Nov 1950. They had three children: Damien, Amanda and Duncan. 7-Damien How was born on 15 Jan 1977. 7-Amanda How was born on 1 Mar 1978. 7-Duncan How was born on 24 Jun 1980. 6-Rosemary Jan Richardson was born on 24 May 1962. Rosemary married Nigel John Scott, son of Robert Scott and Elaine Dawn King. Nigel was born on 29 Sep 1964. They had two children: Benjamin and Jonathon James. 7-Benjamin Scott was born on 27 Mar 1983. 7-Jonathon James Scott was born on 31 Jul 1986. 6-Mark Richardson was born on 8 Apr 1973. 6-Andrew Richardson was born on 16 Dec 1975. 5-Maxwell Alfred Richardson was born on 17 Dec 1931. Maxwell married Elizabeth Slatter. Elizabeth was born on 18 Mar 1937. They had three children: Dale Andrew, Phillip Glen and Dean Norman. 6-Dale Andrew Richardson was born on 7 Jan 1961. Dale married Rosemary Poole. Rosemary was born on 21 Apr 1964. 6-Phillip Glen Richardson was born on 11 Oct 1962. Phillip married Pauline Kay Grummiech. Pauline was born on 3 Nov 1964. They had two children: Ben Anthony and Scott Mathew. 7-Ben Anthony Richardson was born on 18 Apr 1983. 7-Scott Mathew Richardson was born on 11 Mar 1987. 6-Dean Norman Richardson was born on 22 Nov 1966. 5-Connie Edith Richardson was born on 24 Feb 1933. Connie married Jack Sinclair. Jack was born on 15 Aug 1925, died on 17 Aug 2008 in the Launceston General Hospital at age 83, and was buried on 20 Aug 2008 in Lawn Cemetery, Deloraine, Tasmania. They had one son: Craig Richard. 6-Craig Richard Sinclair was born on 1 Apr 1962. Craig married Sheree. 5-Allan George Richardson was born on 9 Sep 1939. Allan married Edna Byers. Edna was born on 7 Apr 1940. They had two children: Steven Allan and Jillian Faye. 6-Steven Allan Richardson was born on 30 Nov 1969. 6-Jillian Faye Richardson was born on 9 Sep 1971. 5-Enid Dorothy Richardson was born on 21 Jul 1941. Enid married Leslie Walter Johnstone. Leslie was born on 31 Dec 1929. 5-Wayne Leigh Richardson was born on 20 Jun 1944. Wayne married Heather Pearn, daughter of Fordyce Dudley Pearn and Winifred Merle Badcock. Heather was born on 6 Oct 1949. They had three children: Clare Isobel, Laura Jane and Kate Olivia. 6-Clare Isobel Richardson was born on 6 Jun 1977. 6-Laura Jane Richardson was born on 10 Apr 1979. 6-Kate Olivia Richardson was born on 5 Apr 1981. 4-Leila Effie May Richardson was born on 5 Jul 1901. Leila married Ralph Reginald Young, son of Edwin Young and Catherine Ann Harman. Ralph was born on 17 Jul 1905 in Paradise and died on 5 Mar 1983 at age 77. They had three children: Olive Jean, Basil Arthur and Neil Reginald. 5-Olive Jean Young was born on 29 Mar 1932. Olive married Clifford Walter Nightingale. Clifford was born on 13 Oct 1934. They had one daughter: Wendy Anne. 6-Wendy Anne Nightingale was born on 27 Jul 1953. Wendy married Mark Anthony Lane. Mark was born on 10 Apr 1958. They had two children: Michela Anne and Jacqueline Louise. 7-Michela Anne Lane was born on 20 Dec 1984. 7-Jacqueline Louise Lane was born on 5 Sep 1987. 5-Basil Arthur Young was born on 3 Sep 1935. Basil married Barbara Ann Forrest. Barbara was born on 15 Feb 1935. They had three children: Robert Peter, Jennifer Louise and Jillian Elizabeth. 6-Robert Peter Young was born on 22 Mar 1957. Robert married Wendy Maralyn Griffiths. Wendy was born on 14 Oct 1964. 6-Jennifer Louise Young was born on 15 Jan 1959. Jennifer married Phillip Grant Overton. Phillip was born on 13 May 1956. They had one daughter: Amy Louise. 7-Amy Louise Overton was born on 8 Nov 1987. 6-Jillian Elizabeth Young was born on 9 Dec 1960. 5-Neil Reginald Young was born on 16 Jan 1939. Neil married Judith Doreen Quick. Judith was born on 25 Dec 1939. They had four children: Kathryn May, Martin Laurence, Rachel Elise and Charlotte Lee. 6-Kathryn May Young was born on 10 May 1961. Kathryn married Ross Maclean Thompson. Ross was born on 16 Aug 1944. 6-Martin Laurence Young was born on 15 Nov 1965. 6-Rachel Elise Young was born on 3 Dec 1969. 6-Charlotte Lee Young was born on 1 Jun 1981. 4-Ella Louisa Mary Richardson was born on 16 Feb 1904 in Chudleigh, Tasmania and died on 9 Jul 1955 at age 51. Ella married Reginald Clifford King, son of Amy Madeline King. Reginald was born on 2 Mar 1905 in Dairy Plains, Deloraine, Tasmania and died on 27 Mar 1987 at age 82. They had three children: Elaine Dawn, Edna May and Joyce Betty. 5-Elaine Dawn King was born on 17 Jul 1935. Elaine married Robert Scott. Robert was born on 31 May 1930. They had two children: Roger and Nigel John. 6-Roger Scott was born on 15 Mar 1963. 6-Nigel John Scott was born on 29 Sep 1964. Nigel married Rosemary Jan Richardson, daughter of Graham Richardson and Dulcie Stephenson. Rosemary was born on 24 May 1962. They had two children: Benjamin and Jonathon James. 5-Edna May King was born on 8 May 1938. Edna married David Bruce Viney. David was born on 22 Jun 1932. They had three children: Stephen John, Graham Reginald and Anthony David. 6-Stephen John Viney was born on 25 Dec 1962. Stephen married Katrina May Robinson. Katrina was born on 27 Dec 1965. They had two children: Daniel Frances and Angela Joan. 7-Daniel Frances Viney was born on 16 Oct 1984. 7-Angela Joan Viney was born on 11 Aug 1986. 6-Graham Reginald Viney was born on 20 Apr 1965. 6-Anthony David Viney was born on 2 Mar 1967. 5-Joyce Betty King was born on 1 Oct 1941. Joyce married Douglas McQueen. Douglas was born on 2 Apr 1938. They had two children: Karen and Jennifer. 6-Karen McQueen was born on 9 Mar 1964. 6-Jennifer McQueen was born on 5 Mar 1966. Jennifer married Terrance Patrick Butler. Terrance was born on 24 Sep 1965. 4-Arnold Alfred Charles Richardson was born on 18 May 1909 in Chudleigh, Tasmania. Arnold married Sylvia Annie Stone, daughter of Harold Edward Stone and Maude Mary Eliza Bott. Sylvia was born on 28 Feb 1912 in Western Creek, Tasmania. They had three children: Joan Sylvia, Mavis Joy and Eric Arnold. 5-Joan Sylvia Richardson was born on 23 May 1937, died on 18 Aug 2005 in Presbyterian Home, Legana at age 68, and was buried in Aug 2005 in Private Funeral. 5-Mavis Joy Richardson was born on 16 Sep 1939. Mavis married Patrick Connors. Patrick was born on 10 Apr 1939. They had two children: Sharon Maree and Kristine Ann. 6-Sharon Maree Connors was born on 17 Oct 1963. Sharon married Andrew Robert Davidson. Andrew was born on 1 Apr 1963. 6-Kristine Ann Connors was born on 4 Oct 1969. 5-Eric Arnold Richardson was born on 4 Feb 1943. Eric married Sandra Lorraine Fellows on 26 May 1973 in Methodist Church, Westbury. Sandra was born on 2 Feb 1946 in Arcoona Hospital, Deloraine. They had two children: Susan Louise and Michael Jon. 6-Susan Louise Richardson was born on 2 Dec 1976. Susan married Grant Drake on 12 Feb 2000. They had one son: Nathan Andrew. 7-Nathan Andrew Drake was born on 8 May 2002 in Queen Victoria Maternity Hospital, Launceston. 6-Michael Jon Richardson was born on 15 Nov 1978. 4-Ethel Amelia Ellen Richardson was born on 26 Nov 1911 in Chudleigh, Tasmania and died on 15 Sep 1986 at age 74. Ethel married Laurence Daniel Eric Ashdown, son of Ernest Henry Ashdown and Anna Maria Quince. Laurence was born on 25 Nov 1902 in Dogs Head, Deloraine, Tasmania and died on 18 May 1987 at age 84. 4-Raymond Vernon Irra Richardson was born on 1 Dec 1913 in Chudleigh, Tasmania, died on 24 Jan 1989 at age 75, and was buried on 27 Jan 1989 in Rose Garden A16, Carr Villa, Launceston. Raymond married Thelma Vera Adams on 17 Nov 1934. Thelma was born on 5 Jun 1912, died on 6 Dec 2004 at age 92, and was buried on 7 Dec 2004 in Rose Garden A16, Carr Villa, Launceston. They had three children: Beverley Thelma, Shirley Louise and Kevin Raymond. 5-Beverley Thelma Richardson was born on 8 Dec 1935. 5-Shirley Louise Richardson was born on 20 Sep 1942. Shirley married Ronald Dunbar Rae. Ronald was born on 12 Jun 1928. They had two children: Belinda Vera and Peter Dunbar. 6-Belinda Vera Rae was born on 16 Oct 1964. 6-Peter Dunbar Rae was born on 6 Mar 1967. 5-Kevin Raymond Richardson was born on 5 Nov 1945. Kevin married Nadine Schieltz. Nadine was born on 6 Jan 1945. They had four children: David, Christopher, Gerrard and Lane. 6-David Richardson was born on 1 Jan 1969. 6-Christopher Richardson was born on 25 Apr 1970. 6-Gerrard Richardson was born on 29 Jan 1976. 6-Lane Richardson was born on 4 Dec 1978.